Ryobi presents the 18V ONE+ Li-Ion Combo Kit, an online-only Special Buy available while supplies last. This combo kit provides 8 essential tools for your DIY needs. Best of all, like every Ryobi 18V ONE+ blue or green tool, the tools in this combo kit work with any 18V ONE+ battery. Includes: (1) P209 Drill Driver, (1) P234g Impact Drill, (1) P505 Circ Saw, (1) P515 Recip Saw, (1) P401 Corner Cat, (1) P713 Vacuum, (1) P305 Glue Gun, (1) P705 Flash Light, (2) P102 Batteries, (1) P118 Charger, (1) Bag. Drill holes and drive screws and other large fasteners with ease with this lithium drill/impact driver combo kit. Features two tools (LDX220 Drill/Driver and BDC202 Impact Driver), 20V MAX* battery, charger, two screwdriver bits, and a soft bag to carry it all. Makita Canada Inc. commenced its operations in Scarborough, Ontario in 1973 and relocated to Whitby, Ontario in 1982 where a 52,000 square foot facility was established. Since then, Makita has evolved into a leading designer and producer of an extensive range of portable electric, cordless and pneumatic power tools as well as a gasoline-powered line of outdoor equipment that includes chainsaws, line trimmers, generators, power cuts and water pumps. Makita is the only Canadian manufacturer of high performance professional power tools. Each Makita power tool is built with the finest materials and subjected to strict quality control examination, including a test run under power before leaving the factory. This Milwaukee M12 Cordless Two-Piece Combo Kit includes the Multi-Tool (2426-20) and Screwdriver (2401-22). The innovative M12 cordless system is designed to deliver the power and torque required for professional applications, in a size that reaches the tightest and toughest places. Powered by REDLITHIUM, the M12 cordless system offers unmatched power, speed, and tool belt portability. The Milwaukee M18 Two-Piece Cordless Lithium-ion Combo Kit includes the 1/2-inch Hammer Drill Driver (2602-20) and the 1/4-inch Hex Compact Impact Driver (2650-20). The M18 Cordless System's patented technologies and electronics, innovative motor design, and superior ergonomics provide the most efficient blend of power, weight and performance in the industry. Powered by REDLITHIUM, the M18 cordless system delivers more torque, more power, and longer runtime than the competition. 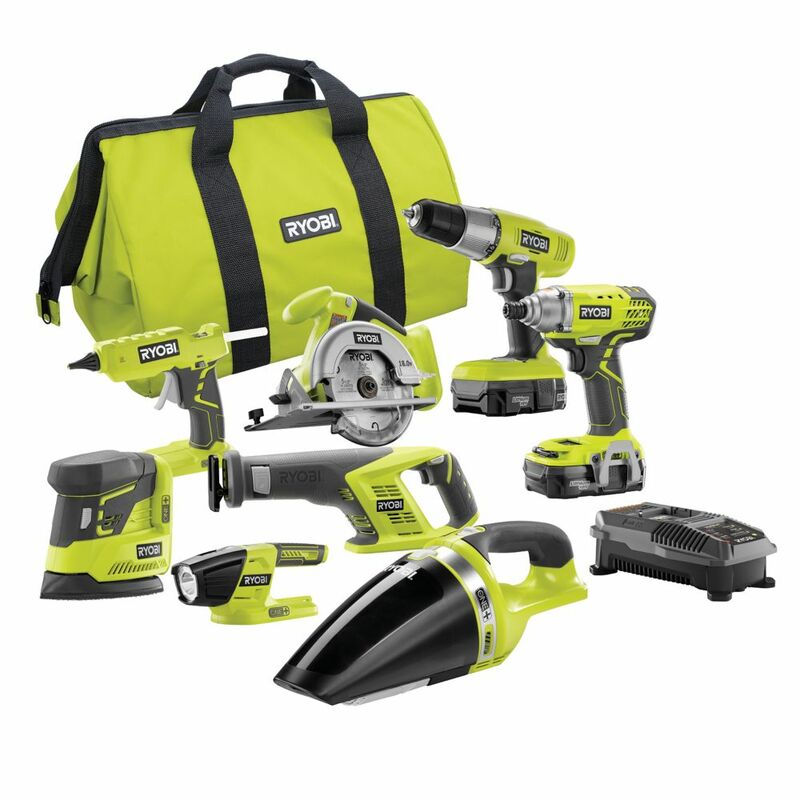 Durable and built-to-last, this cordless kit is ideal for jobsite use or for DIY projects around your home. 18V ONE+ Cordless Lithium-Ion Combo Kit (8-Tool) with (2) 1.3 Ah Batteries, Charger and Bag Ryobi presents the 18V ONE+ Li-Ion Combo Kit, an online-only Special Buy available while supplies last. This combo kit provides 8 essential tools for your DIY needs. Best of all, like every Ryobi 18V ONE+ blue or green tool, the tools in this combo kit work with any 18V ONE+ battery. Includes: (1) P209 Drill Driver, (1) P234g Impact Drill, (1) P505 Circ Saw, (1) P515 Recip Saw, (1) P401 Corner Cat, (1) P713 Vacuum, (1) P305 Glue Gun, (1) P705 Flash Light, (2) P102 Batteries, (1) P118 Charger, (1) Bag. 18V ONE+ Cordless Lithium-Ion Combo Kit (8-Tool) with (2) 1.3 Ah Batteries, Charger and Bag is rated 4.3 out of 5 by 9. Rated 5 out of 5 by RobR from Always happy with Ryobi Been using Ryobi for many yesrs, never let me down. Got this set for my son when he bought his house. Perfect tools for personal use and new lithium batteries are great. Rated 1 out of 5 by Ress from TOTAL GARBAGE, DON"T BUY IT!! WORST JUNK I HAVE NEVER OWNED, WON"T EVER BUY AGAIN!!! SAVE YOURSELF THE PAIN I HAVE GONE THROUGH AND THE WASTED MONEY AND DON"T BUY THIS GARBAGE!! BATTERY FAILED RIGHT AWAY AND CUSTOMER SERVICE WAS THE WORST EVER!! EVEN WHEN THE BATTERY WORKED FOR A FEW MONTHS IT WAS USELESS AND UNDER POWERED!!! IT DESERVES A NEGATIVE RATING BUT I HAVE TO GIVE IT A 1. Rated 5 out of 5 by Fernando from Great set! Great set! Has every thing I need.. and good quality. Rated 4 out of 5 by Judge 1 from Ryobi tool package Bought this as a christmas gift for our son. He seems to like the tools,He did phone one day bragging about the power that the impact wrench had! The reason we got him Ryobi was that he had already started with them and liked the tool he already had! Rated 5 out of 5 by jima from A good value A great light to medium duty set, and a great value. The specs for the tools seem a little lower than that of other Ryobi sets available for higher prices. Unless your projects are very small, you really need an extra set of better batteries (like the 4 amp hour two pack) for the saws, or for the drill or impact if you're doing something like building a deck with it. The small batteries are nice to leave on the flashlight, and for the drill or impact, whichever you tend to use occasionally around the house, and they will do the job for occasional use of the other tools, if you mostly just want to have them around and available, not use them regularly. Hey there, I originally asked this question, now that I have the kit, you should know that the batteries are not 2.6 amp, they are 1.3amp, so that was a disappointment. I see the title has now been updated to specify the battery amp hour as 1.3, making it a moot question. It's helpful to buy the two pack of 4 amp hour batters with this kit. I paid $130 for that two pack, which is a non-sale price, but a good buy for the batteries. If you're not willing to do that, unless you'll almost never use these tools, I wouldn't bother with this kit. Besides having been misled about the battery amperage, I'm quite happy with the set for light to medium duty use. does the circular saw and reciprocating saw include any blades? Hi Dave, yes they do. The Ryobi Team. When will the matching Strut Stick vac be available to add to this combo, which I just ordered? Hi, this item will be available early next year. The Ryobi Team.